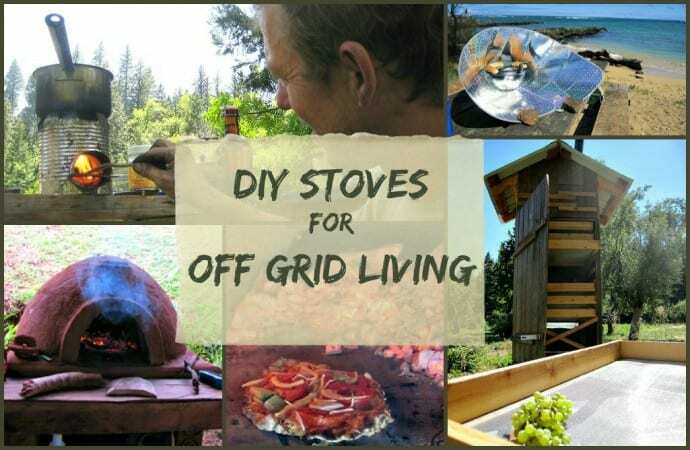 My wife Emma and I have been farm-hopping for the last two years, volunteering with off-the-grid gurus who are doing all sorts of ingenious things. Many of these have been developed by NGOs looking to combat the negative health and environmental impacts of cooking over wood fires indoors, as much of the world still does (The WHO estimates 3 billion). But that doesn’t mean the rest of us can’t take advantage as well! 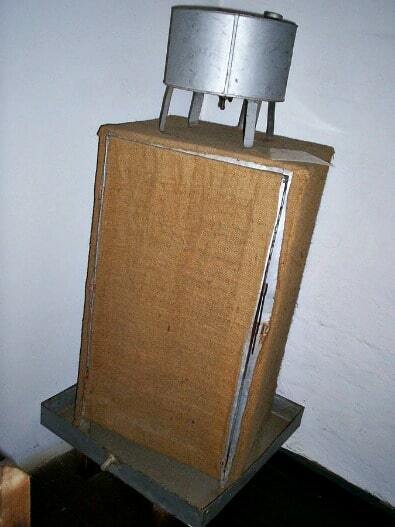 There are several problems that accompany typical wood-fueled stoves. First, it tends to be quite wasteful because heat is constantly escaping from the sides of the fire. Wood stoves of this type are also very smoky. If they’re indoors, this will inevitably have seriously harmful effects on people’s health. Plus, they simply take a lot longer to cook with. 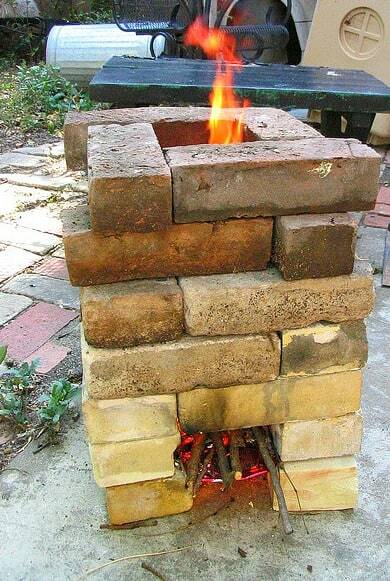 Enter the rocket stove. This is a super-efficient design that prevents any heat from escaping. It also completely burns the wood used, with very little smoke. This is accomplished by feeding the wood into a horizontal chamber, fueling a fire burning where that chamber meets a vertical stovepipe, and corralling all of the heat produced straight to the hub. The power of rocket stoves ensures that cooking is much faster. Since it doesn’t require much wood, you can gather small pieces that naturally fall or come from normal pruning. 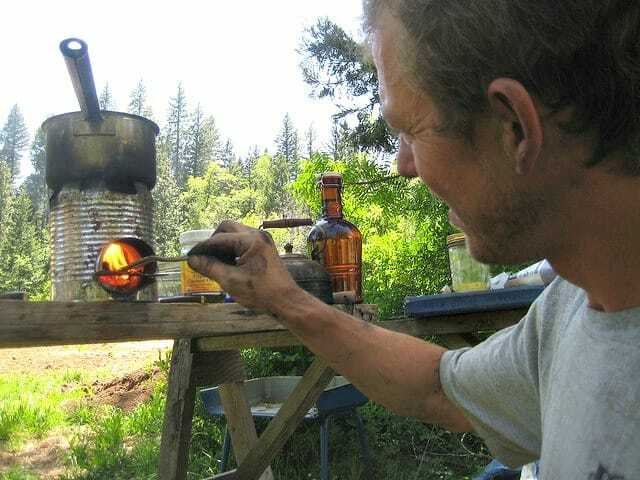 Rocket stoves can be bought online or, better yet, portable camping set-ups can be made from upcycled tin cans. 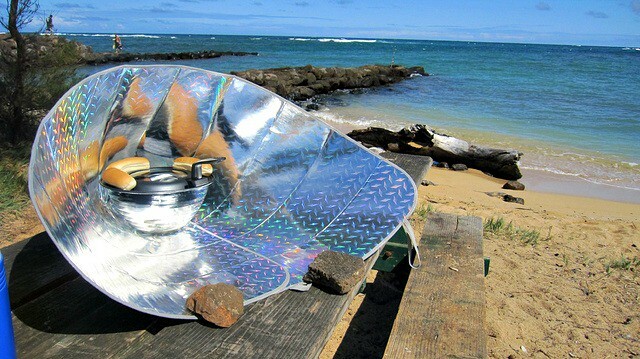 Another option for boiling up a stew or soup without making smoke or using hours’ worth of energy is the solar cooker. 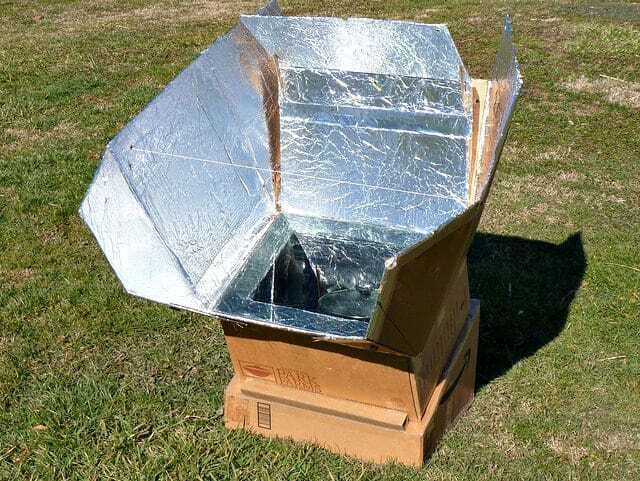 Of course the solar cooker is using energy– that of the sun. But this solar heat is there to be harnessed whether we do so or not, so there’s no waste involved. What a solar cooker does is use the heat provided by nature to cook food. It’s hard to get much more eco-friendly than that! There are many solar cooker designs to choose from. Some are the shape of satellite dishes and extend pots way out into the vast open air, where the reflection of the sun’s rays concentrate into a powerfully hot beam. There are also boxes that kind of cradle the pots into little reflective treasure chests. The idea behind any shape is to maximize the amount of sunlight that reaches them, and that’s where the energy for cooking comes from. These little cookers have been really pushed via NGO channels, especially those trying to help people in places with a lack of wood and even less gas and electricity. Consequently, there are numerous options for the keen do-it-yourselfer to try (or buy). 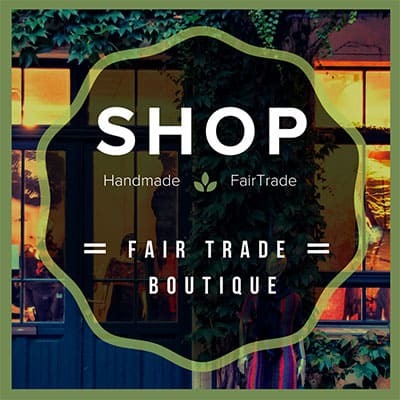 The materials used are often simple, upcycled trash put to creative use. In other words, it’s not only eco-friendly, but also a cool little science project to do with the kids. Another popular way for harnessing the sun’s energy to cook outdoors is to build a food dehydrator, which is also called a solar dehydrator. Unlike the Ronco electric food dehydrators of Saturday morning infomercial lore, these solar babies are powered by the sun and most definitely will not fit on the kitchen counter. But they are fairly simple to build, to use, and to understand. Unlike solar cookers, food dehydrators don’t need to concentrate their heat so precisely. They’re usually fashioned from a glass panel or two stationed over a painted black box. The most important ingredient in making a successful dehydrator– electric or solar– is airflow. 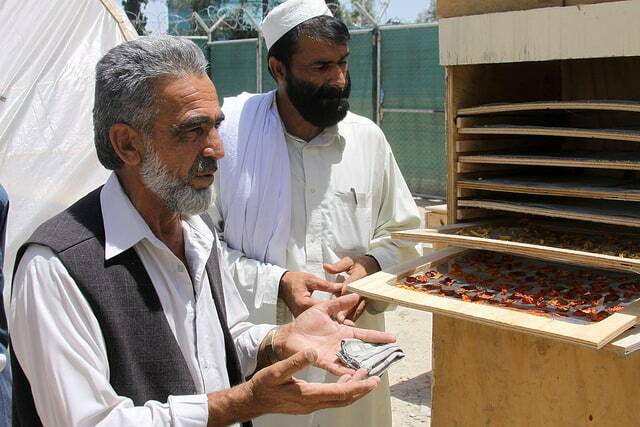 For solar dehydrators, that comes in the form of a separate, thinner hot box attached to the bottom of the contraption. This allows cool air to enter and be heated before going into the dehydrator. The air rises around the food, stealing away the moisture, and then escapes through vents at the top. 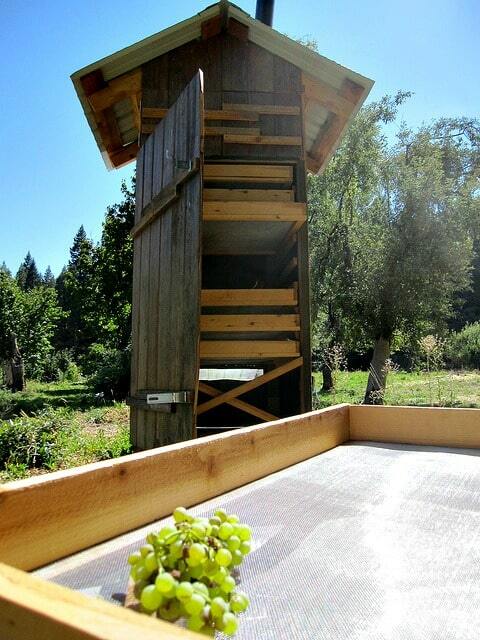 Solar dehydrators are really handy because they’re a great way of preserving food for later use. Many of us are fond of raisins, fruit leathers and jerky. But dehydration also creates many of the herbs, mushrooms, kale chips, and instant soup mixes we enjoy. In other words, this is a useful device that costs much less than the Ronco edition and even less (i.e. nothing) to operate. 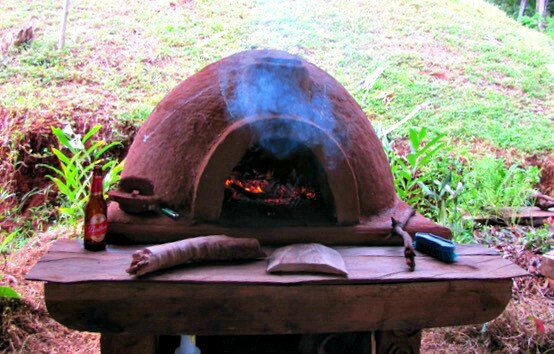 The cob oven is the contraption of dreams for the rustic baker. They’re often called pizza ovens, and the beauty of firing one up is that, once they’re fully heated, there will be ample time for baking several loaves of bread, cookies, and at least a dozen or more pizzas. What’s really cool is that the Cob Oven is made from the earth beneath our feet. Because of this, they can cost nothing (or almost nothing) to make. “Cob,” for those unfamiliar with the term, is a building technique that uses clay, sand and straw to create solid structures. These three components are moistened to a malleable level and then molded into shapes by stacking hunks (a.k.a. cobs) together. When the mold dries, it becomes a remarkably durable solid structure. Cob houses in various parts of the world have been standing for hundreds of years. It’s a material long revered for its insulating and heat-absorbing qualities, and it’s also perfect for making ovens. The photos above are of a real patio project that took my wife and I a couple of weeks to make (here’s a full write-up about the first Cob Oven I made). It takes several hours to get the fire heated up to pizza-making standards. But once they get rolling, they go for a long time. 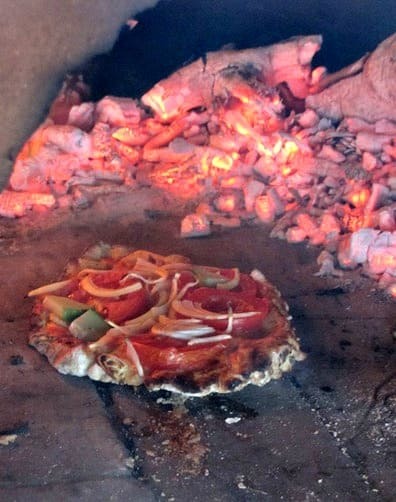 Cob Ovens can also be a centerpiece for parties: Friends and neighbors come over for make-your-own pizza nights. The key to energy efficiency is to bake as much as possible when it’s hot. While this device isn’t exactly cookery in its truest form, few people are going to argue with the wonderful culinary attributes of refrigeration. But most of us don’t realize that we can actually cool our food and store it for days on end without the need for a plug socket (or, much worse from an environmental standpoint, Freon). The Coolgardie safe (or fridge) hails from Australia, and it’s as low-energy as appliances come. In a weird way, Coolgardie fridges use the sun to cool food. They’re built as a basic box with interior shelves. The sides are covered by screen to allow air to pass through, but to prevent insects and animals from getting in. There is a tray of water atop the box. Porous clothes are draped from the tray over a couple of sides of the safe, and then the whole thing is put in a shady, breezy spot. As the water wicks down through the cloth and vaporizes, the wind pushes it through the box, which serves to keep the food inside nice and cool. Make no mistake, this is not an electricity-free beer fridge to put out in the backyard. Sadly, there will be no frosty mugs. But it will undoubtedly keep your food fresher for much longer than having no fridge at all.